This chapter presents a taxonomy of the latest behavioural biometrics, including some future oriented approaches. Current research in the field is examined and analyzed along with the features used to describe different types of behaviour. After comparing accuracy rates for verification of users using different behavioural biometric approaches, researchers address privacy issues which arise or might arise in the future with the use of behavioural biometrics. Finally, generalized properties of behaviour are addressed as well as influence of environmental factors on observed behaviour and potential directions for future research in behavioural biometrics. With the proliferation of computers in our every day lives need for reliable computer security steadily increases. Biometric technologies provide user friendly and reliable control methodology for access to computer systems, networks and workplaces (Angle, Bhagtani, & Chheda, 2005; Dugelay, et al., 2002; Lee & Park, 2003). The majority of research is aimed at studying well established physical biometrics such as fingerprint (Cappelli, Maio, Maltoni, Wayman, & Jain, 2006) or iris scans (Jain, Ross, & Prabhakar, 2004d). Behavioural biometrics systems are usually less established, and only those which are in large part based on muscle control such as keystrokes, gait or signature are well analyzed (Bolle, Connell, Pankanti, Ratha, & Senior, 2003; Delac & Grgic, 2004; Jain, Pankanti, Prabhakar, Hong, & Ross, 2004c; Ruggles, 2007; Solayappan & Latifi, 2006; Uludag, Pankanti, Prabhakar, & Jain, 2004). In accomplishing their everyday tasks human beings employ different strategies, use different styles and apply unique skills and knowledge. One of the defining characteristics of a behavioural biometric is the incorporation of time dimension as a part of the behavioural signature. The measured behaviour has a beginning, duration, and an end (Bioprivacy.org, 2005a). Behavioural biometrics researchers attempt to quantify behavioural traits exhibited by users and use resulting feature profiles to successfully verify identity (Bromme, 2003). 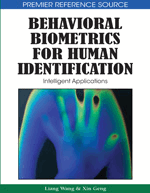 In this section authors present an overview of most established behavioural biometrics. Behavioural biometrics can be classified into five categories based on the type of information about the user being collected. Category one is made up of authorship based biometrics, which are based on examining a piece of text or a drawing produced by a person. Verification is accomplished by observing style peculiarities typical to the author of the work being examined, such as the used vocabulary, punctuation or brush strokes. Category two consists of Human Computer Interaction (HCI) based biometrics (Yampolskiy, 2007a). In their everyday interaction with computers human beings employ different strategies, use different style and apply unique abilities and knowledge. Researchers attempt to quantify such traits and use resulting feature profiles to successfully verify identity. HCI-based biometrics can be further subdivided into additional categories, first one consisting of human interaction with input devices such as keyboards, computer mice, and haptics which can register inherent, distinctive and consistent muscle actions (Bioprivacy.org, 2005b). The second group consists of HCI-based behavioural biometrics which measure advanced human behaviour such as strategy, knowledge or skill exhibited by the user during interaction with different software.